One of Dublin's newest state of the art guest houses, the Eliza Lodge faces Dublin's millennium bridge and is close to trendy Temple Bar, the coolest spot in town, with its vast range of bars, clubs, cafes, restaurants and cultural activities. Offering an excellent standard of accommodation, personal service and an ideal location the Eliza Lodge is the perfect choice for the modern guest. Each of the modern air-conditioned bedrooms is fitted with new and luxurious furniture and natural wood if featured throughout. The rooms are fitted with all facilities necessary for the modern guest including TV, direct dial telephones, tea and coffee making facilities, ironing facilities and personal safety deposit boxes. Each of the executive rooms includes bay windows and Jacuzzi baths and the penthouse suites also include a large balcony and very large window expanses. Baby cots and cribs are available on request. The Eliza Lodge is home to Eliza Blues Restaurant, a charming restaurant offers food prepared to the highest international standards. The menu includes starters, soups, fish, poultry, vegetarian dishes, salads, pastas and steaks. The visitor can choose from breakfast, lunch, early bird, group lunches and an excellent a-la-carte menu. 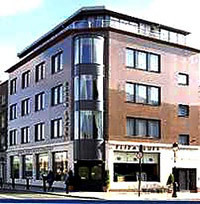 The guest in Eliza Lodge will enjoy strolling through trendy Temple Bar the hippest place in town. Temple Bar has a fine selection of bars, clubs, cafes and restaurants and charming shops selling very trendy gear. The exclusive area of Grafton Street with its wonderland of shopping and free entertainment by talented buskers is close by. Many of the other major visitor attractions are just a short walk away.